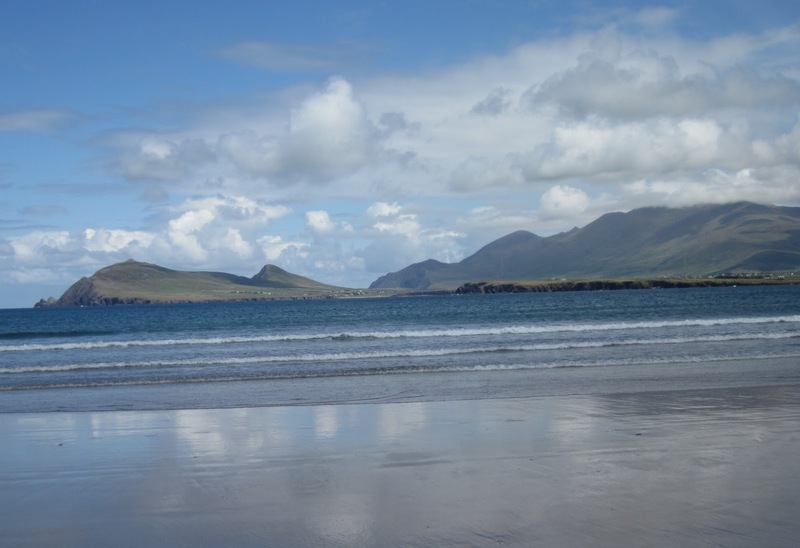 In Corca Dhuibhne you're always aware of the ocean. And with water on three sides of you, the light is always amazing. 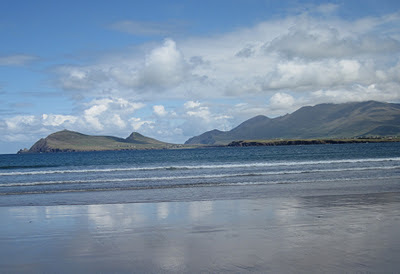 A mountain range runs down the narrow peninsula, disappearing into the waves at Dún Chaoin and rising again in seven offshore islands, called the Blaskets. The Atlantic waves are white where they curl against the cliffs and edged with pale golden foam where they thunder onto the beaches. Farther out to sea, their colours constantly change under the wind-blown clouds, shifting from turquoise to emerald, pewter and pale jade. At sunset they're streaked with scarlet. At dawn they're tinged with faintest mother-of-pearl. The people of the peninsula have always been fishermen. For generations they fished from boats made of tarred canvas stretched on slender timber frames, powered by oars and single sails. 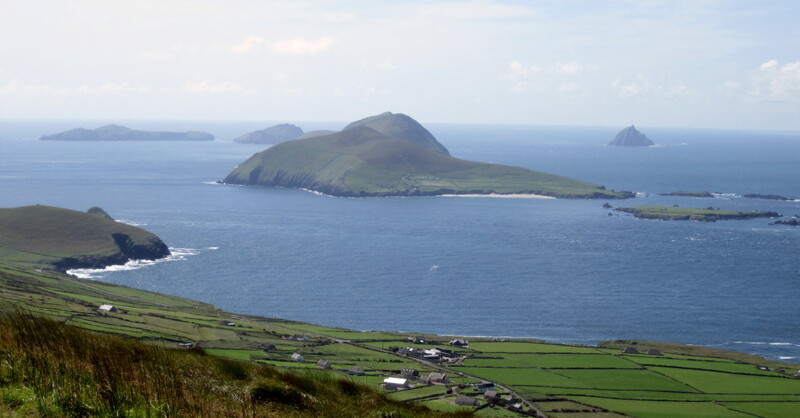 In the past, the Blasket islanders depended on the ocean for the food they ate and the produce they sold; a bad year's fishing could bring them close to famine. In the past, people believed that when food was taken from rivers and oceans something had to be given back to preserve a state of balance. So island fishermen used to throw a tribute of tobacco into the waves as they passed a certain rock that's still called An Seanduine. Its name means The Old Man. That sacrifice of expensive tobacco, enacted within living memory, was a ritual gesture as the boats left the safety of the islands to face the ocean waves. Thousands of years before that, ancient seafarers crossed the ocean in boats built on the same principle - timber frames covered with greased hides. Long before St. Brendan's legendary voyage from Brandon Creek to America, pagan Celts set out from Irish harbours to find The Isles of The Blessed, where silver apples grew on golden trees and the Salmon of Knowledge swam in a crystal pool. 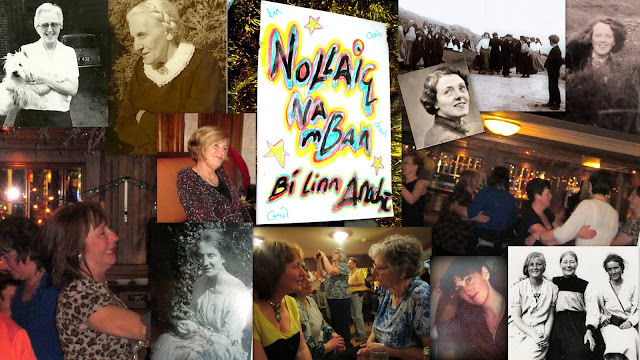 And, on their way, so the legends say, they met the sea-god, Mannanán Mac Lír. There’s a story still told that describes Mannanán driving his chariot across the waves, his horses’ manes tossing like foam and his cloak, woven of mist, changing from blue-green to silver and then to the purple of evening. He was the Celts' expression of the ocean itself - a beautiful, numinous, dangerous source of life, from which they could draw, and on which they depended. Ancient Celtic seafarers kept themselves alive by fishing with nets and spears. And so, like the islanders' sacrificing pinches of tobacco to gain a good catch, they threw beautifully-crafted gold artifacts from their hide and timber boats, to ward off Manannán's anger and pay for what they took from his world. I miss the Atlantic ocean here in London. But I love the sinuous river Thames, which has its own magic and legends. Like the ocean, the Thames yields food; for countless generations, Londoners' favourite dish has been fished, cooked and served up here, straight from the river. I'd like to say I love eating it. But if I did I'd be lying. The truth is I get shifty when I'm offered a plate of eels. Eel pie and mash, and stewed or jellied eels are a London tradition. There's a 'pie and mash' shop round the corner here, on the Tower Bridge Road, opened in 1902 and still going strong. It's called Manze's. People queue outside every day for takeaways; and the interior, with its mirrors, green and cream tiled walls, and long wooden tables, is always packed. Behind the counter, ladies dish out eels and pies and mashed potatoes and liquor - a thin, green gravy, ladled out of huge containers. It's a noisy, friendly place, full of a sense of the local community. I love its cheerful, efficient staff and its beautifully-preserved interior. Meanwhile, I've learned something else. Another of those things that make Corca Dhuibhne and Bermondsey seem so similar, though they're so different. In Corca Dhuibhne fishermen are always discussing EU quotas, pollution control, and the damage done to fish stocks and habitat by deep-sea trawling. I'm used to that. 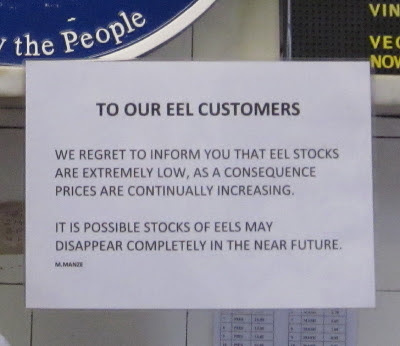 But what I didn't know till yesterday is that in the last five years London's eel supply has dropped by 98%. The reason? Over-fishing. Pollution. And loss of habitat. 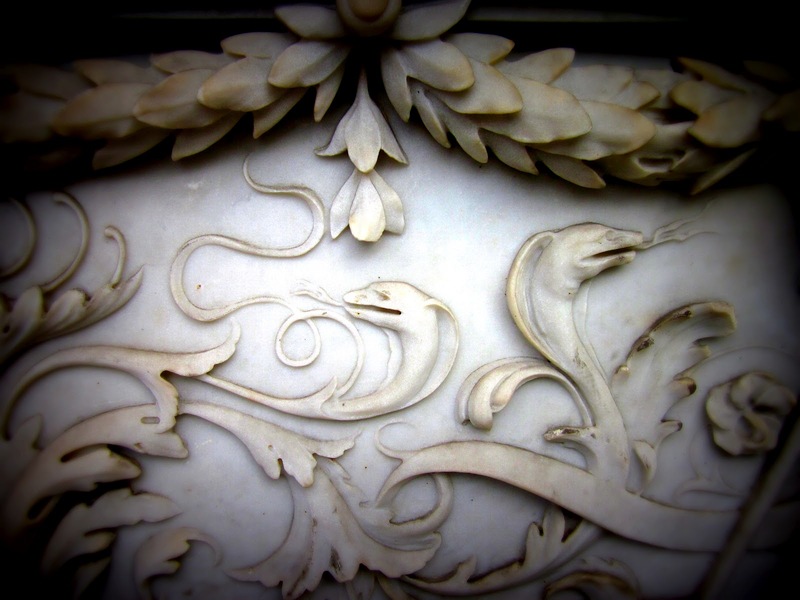 Once London's eels were fished from the Thames. Now most of them come from Holland. The European Eel only spawns in the Saragasso Sea in the middle of the Atlantic. They can't be bred in capticity or sustainably farmed. So if we over-fish them, or destroy their habitat, we won't have them at all. And, it looks like that's exactly what's going to happen if the current trend continues. For centuries, Londoners scavenging along the banks of the tidal Thames have found objects that were once thrown into the water as offerings to ancient river-gods. 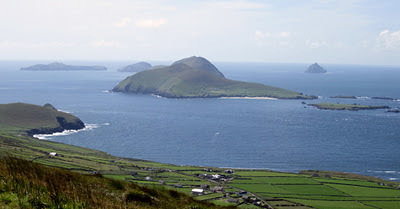 Like the seagoing Celts' artifacts, and the Blasket islanders' tributes of tobacco, those ritual sacrifices recognised the need to be aware of the rich and complex life that oceans and rivers sustain. Maybe we should look back at our ancestors and learn some respect. Hi Felicity, this is a fantastic post. As always I appreciate the parallels you draw between your two homes. And I've never tried eel pie, but I'd definitely give it a try. Though it sounds like if the reckless, unmindful way we are treating the planet continues to be the norm, I may not be able to (though that is, of course, the least of my concerns regarding the issue.) It's important that great writers like you bring attention to these problems. Thank you for sharing your insight. Loved this, so entertaining and informative.